With summer ending, these tasks will help prepare for the fall on the inner and outer home for the season. Gutters - if the leaves are beginning to fall, this is the time to clean them and certainly if screens or guards are to be put up. Roof - inspect the roof before the ice and snows of winter months arrive. Look at all areas and patch with a quality compound or replace shingles as needed. This could be one of the few last chances. Fallen Debris - collect any branches before the leaves. 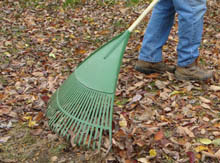 If the leaves have become settled due to dampness it might be necessary to apply a power blower to lift them from the soggy turf. Exterior Finishes - caulk where needed. Replace any rusty screws such as on downspouts with pre-painted screws to prevent premanent rust stains. Decks - remove unwanted items from the deck surface, particularly those with metal feet to prevent staining over time. Remove any packed leaves and debris from the slats for maximum ventilation. Fencing - replace any rails where split or where they are not expected to survive the coming months. Groundwork/Soil - mix in the collected leaves with some of the garden soil for the upcoming planting season. Windows/Doors - remove the screens and store until springtime. Add seals in window and door areas to hinder airflow. AC/HVAC - adjust programable thermostats for electrical savings since temperatures are now cooling off. Garage - remove any liquids that may freeze when the temperature happens to plummet. Adjust garage door sensors and tighten down to keep from going out of adjustment. Enclosed Patios - perform a cleaning now while you can, from top to bottom. Fireplaces - have inspected for safety and refill any propane tanks. Kitchens/Baths - this might be the time to have any tile grout sealed throughout the home to protect against dampness. Freezers in kitchen and storage areas could require defrosting while there is still opportunity to do so.